Adjustable Bed Donation Help Veteran From Maryland Overcome Back Pain. Marine Gunnery Sergeant John Hayes has not been able to sleep for more than a few hours at a time since he stepped on an IED in Sangin, Afghanistan on December 28, 2010. Two months ago he received a new adjustable bed through Easy Rest Adjustable Sleep Systems’ “Beds For Our Troops” program. Now he sleeps straight through the night. “Before receiving our Easy Rest adjustable bed John would only sleep about 3 hours at a time,” reported GySgt Hayes wife, Janel. “He couldn’t move around much to get comfortable and he couldn’t sleep well laying flat. Now we both sleep way better than before. After lying in the bed for 10 minutes John conks out and he sleeps for 9 or 10 hours. And, it’s even helped me with my back pain,” she added. GySgt Hayes had been in the Army for 12 years and was on his fourth deployment when his partner located an undetonated ordinance. While retracing his steps to return and assist him, he stepped on a buried IED, resulting in the traumatic amputations of both of his legs. He was flown to Landstuhl, Germany and once stabilized he was brought to Walter Reed National Military Medical Center in Bethesda, Maryland, where he has been receiving medical treatment and assistance ever since. GySgt Hayes has had more than 60 surgeries to date, including one that required the removal of his pelvis on his left side. GySgt Hayes isn’t letting his injuries get in the way of enjoying life. 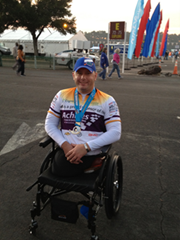 He joined Achilles International and learned how to use a hand-crank wheelchair – a three-wheeled cycle powered by hand pedals – and has competed in several races. He’s started to enjoy one of his favorite pastimes again by learning some adaptive fishing techniques. He also enjoys working on old cars when he has the opportunity. He lives in Maryland with his wife and three daughters.